F.C. ROV-PILOTING provides remotely operated vehicles (ROV) for inspection and light work class ROV applications on offshore platforms. The company’s ROVs are portable and can be transported according to the client’s specifications to ensure flexibility and cost-effectiveness. F.C. ROV-PILOTING specialises in inspection services, accompanied by video recordings. These are performed using multi-beam sonar, which is suitable for areas of low visibility. ROVs are capable of obtaining a GPS position on targets when combined with positioning systems. The company also performs services such as tank inspections, classification inspections, incurrence surveys, conductor guidance, spudcan surveys and search-and-rescue operations. F.C. ROV-PILOTING provides support for cable work repair, pre-laying and touchdown monitoring on onboard cable laying barges, and smaller vessels. The flexibility of its solutions and setups ensure client efficiency. F.C. ROV-PILOTING offers solutions suitable for dangerous areas, such as pipes, tanks, shipwrecks or hot water. The company implements inspections and small tasks, such as debris collection, thickness and cathodic protection measurements, and marine residue removal. Using 500bar high-pressure cleaning systems, F.C. ROV-PILOTING can perform pre-inspection removal of marine residue from bolt / knots, welding or cracks. The company also offers inspection services after the cleaning process. F.C. ROV-PILOTING is experienced in developing specialist equipment to enable clients to perform salvage operations. The company offers smaller ROV systems to attach lifting equipment, in order to optimise costs and space onboard the vessel. F.C. ROV-PILOTING performs specialised testing and development through client collaboration. The company consults clients while adapting tools for its ROVs, before testing them in its 30,000l test pool, or direct in the sea, before starting a job. With two of its ROVs, F.C. ROV-PILOTING works closely with the client during the manufacturing stage to ensure that they receive the right solution. F.C. ROV-PILOTING offers a ten-day ROV pilot training course performed on the company facilities or at sea, combining practocal training and theory. The company also provides ROV task and tool development consultancy services. Founded in 2008, F.C. ROV-PILOTING is based in south Denmark. The company has six operational ROV systems and two containers for clients requiring solutions for long-term operations. The workshop is designed for maintenance and development, testing and storage. F.C. 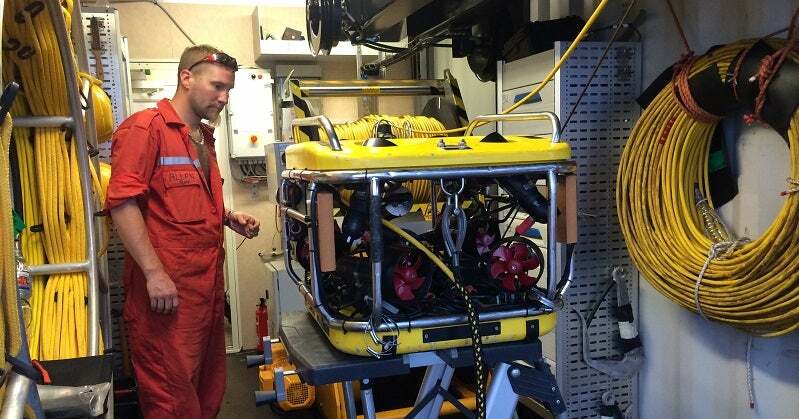 ROV-PILOTING works worldwide, with a focus on Europe and Asia. The team is very experienced in a wide range of tasks and equipment, and all employees in the company are ROV trained pilots. FC ROV-PILOTING have announced they will be presenting the Ocean Business 2017 exhibition. Ocean Modules V8 M500 is the only remotely operated vehicle (ROV) that allows unlimited 360° pitch and roll control whilst maintaining constant platform stability.